This week I was expecting a call to say my seats had arrived at Mustang Maniac for me. I didn’t get any email from Adam to give me a hint. The trip there was wondering what I was going to do for the day. I arrived to find carnage in the yard, the guys were moving stuff around and an old ’67 fastback was about to be scrapped, cars were all over the place and lorries littered the yard, just for the day mind you. Adam looked like he needed another pair of hands so I got to work and helped out where I could. After the work was done and time out was called for a cup of tea, Adam said I have a surprise for you. We eventually went to his small storage area where he had carefully stacked my seats. Yep, my seats were back at long last from Trevor the trimmers. My smile fixed to my face as we transported them to the main workshop. Adam moved the car for me from the storage shop to the main workshop to make it easier to fit the seats. We laid them out in order to see what we had and what we needed. Adam picked them up late Saturday night and waited for them to be finished for me. We needed all the hardware like the fixings and trims. All my old parts were damaged or just not good enough for the seats now. The seats have been fitted to a superb level and look amazing. The “Pony Interior” colour scheme is blue and white. 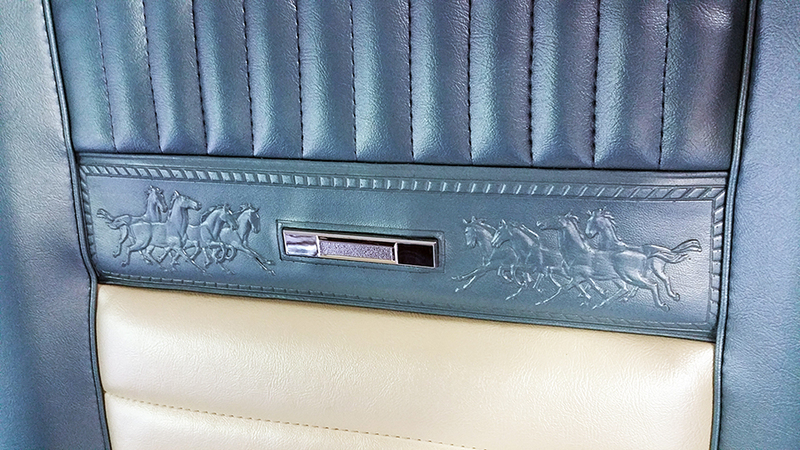 I had to have the door cards custom-made as I didn’t want the matching padded “Pony” interior ones. These are bulky and have a habit of cracking and tearing by the handle of the door. The standard door cards look cleaner and the door handles are attached better to the frame of the door. 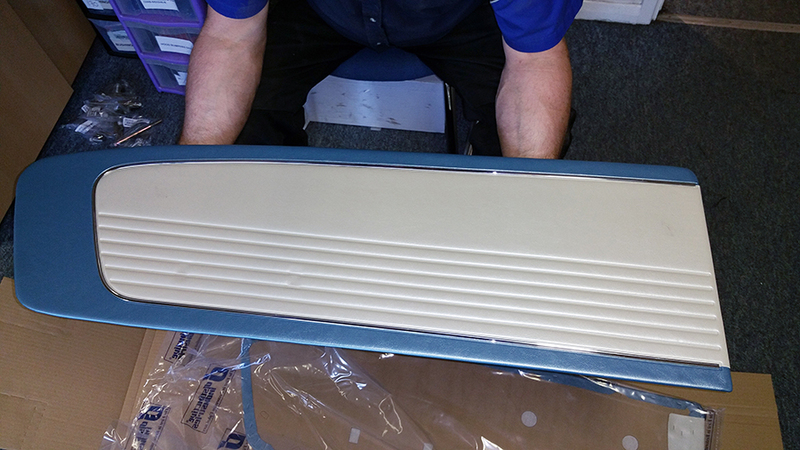 This was a sneak peek of the colour back in April this year when Adam took delivery of the door cards with the chrome trim. The seats I had when I got the car seemed to have been changed a number of times, but things suggest that the trim level in the car was Pony style in the first place. The reason for the delay was the rear seats don’t have a foam kit you can buy to replace the old knackered ones I had. That meant the rear seats had to be made up from scratch using new materials that looked and felt right behind the trims. I’m glad I went to the effort to restore the seats frames and springs properly now. This was the old seat trims and seat frames I started work on back in April of this year. The new seats and extremely high level of finishing. 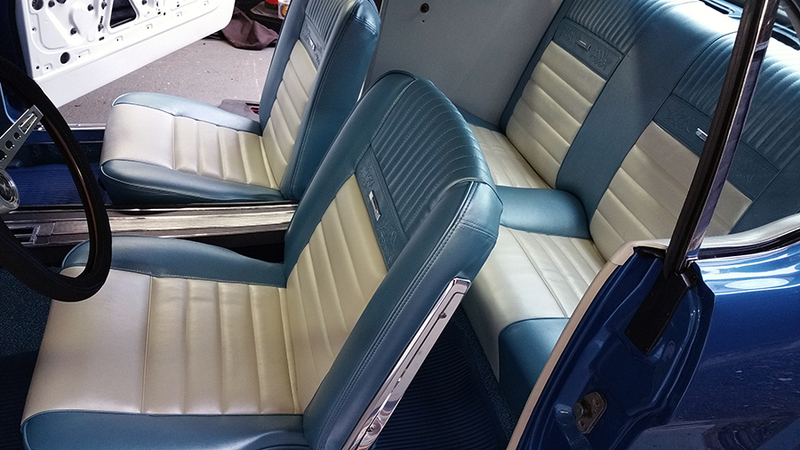 We started with the rear seats as they are pretty much done and just need fitting straight into the car. The seat backs drop onto two brackets at the top and secured with two bolts at the bottom via the brackets. 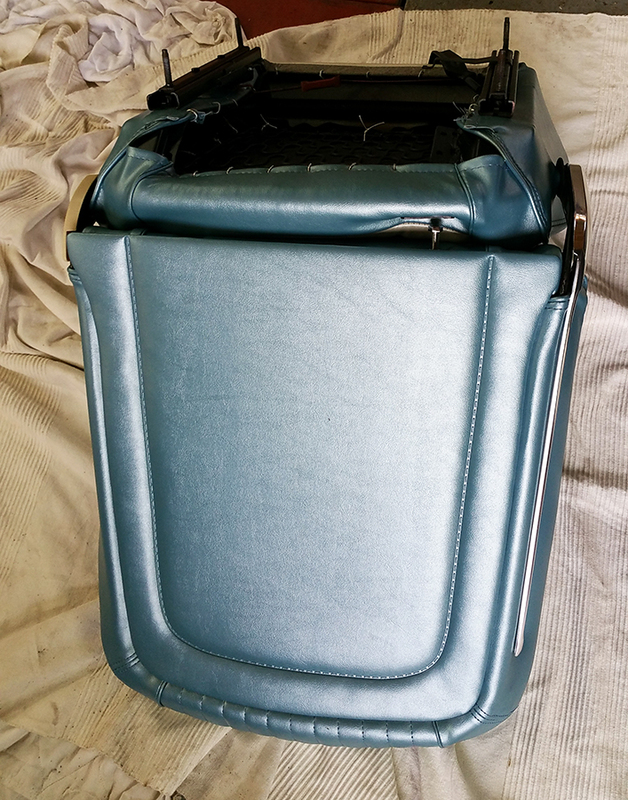 The rear seats base pushed under the seat backs and just clipped into place on the floor, the top holding the bottom down firmly in place. Adam had to check the seats out to make sure all was OK of course, he beat me into the seats “as I went to get them”, that was a few funny moments scrambling to see who would get to sit in the seats first. The trouble was the Adam had declared the race was on as he was halfway in the car as he announced it. Was I bothered? Not at all. The reason is simply because I certainly won’t be the first to drive it either when she is “finished”. I want the guys at MM to drive it and set it up how it should be, and iron a few teething issues (if any) out first. Here is the pic of a happy winner of the impromptu game of Mustang musical chairs! The fronts were going to be harder to complete and I was a little nervous about this bit, as I will explain in a bit. The seats had to be put together first before fitting into the car obviously. The first step was the often missing washers on the hinge pins. The back of the seats are adjusted by a single bolts that presses onto the rear frame. Both the bolt and the protecting plate needed to be pierced into the vinyl trim. This was the bit that worried me, cutting holes in new material. Adam has a right-angled tool to help find the screw holes so you don’t have to keep making holes in the material. The next part was to mark out where the clips go into the frame of the seat back using this simple little tool. The locating hole was made, then a small sharp punch was used to make a neat cut in the material for the clips to go into. The seats were put together and the hinges were levered together to make them fit into the seat back holes. An “R” clip is used to go through the hole to hold the hinges together. Chris was on hand to help out now which was a great help. The outside edges of the seats have a chrome trim which screws into the material and also needed some very careful marking out. The inner hinge has a basic plastic cover to hide the inner and smaller hinge and the “R” pins. The seat rails are held in place by two bolts each end of the track and the corresponding frame holes. To make the lever work so you can move the seat on the tracks, there is a metal rod that clips into each side of the rails and is adjusted by turning the quite neat box section on the thread to equalise the lever adjustment. To get into the back of the car the seats just fold forward, these hinges are also angled so that the seats fold away towards the centre of the car to give more room which is a nice touch. 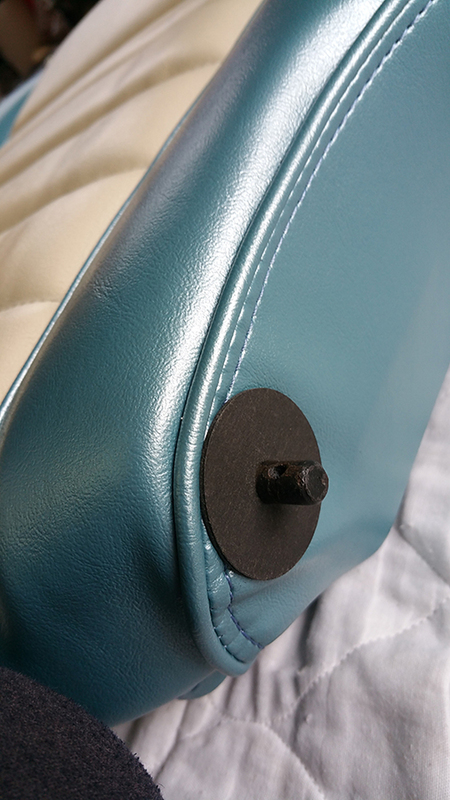 The backs of the seat are card covered with the same material, the clips are slipped into the card cut outs and then pressed into the corresponding holes on the seat back frame. Due to the thickness of the material the corners at the top were quite difficult to press into the frame. You must be careful to press the clips here or the clips will puncture the material and ruin it. I am not a fan of this idea, but it last for fifty years so far, so it can’t be that bad. With the seat now assembled it was a case of dropping the seats into the four holes in the seat bases. The carpet had been carefully cut earlier into the seat bases to make the appropriate hole for the rail studs. The seats were held in place by four cupped screws under the car tightened through the floor pan. The finished effect (I think) is staggering. The finish is better than I was expecting it to be and the seats look right in the car with the colour scheme. Well I think they do anyway, but then again – I am biased! The door cards will be put on after the road tests have been done, in order to make sure there are no rattles of adjusting that need to be fixed inside the doors. Next week There are more jobs to be done yes, handles, drip rails, side sill covers, fuel tank bolted down, wire tidy in the trunk etc. But for now I am a super happy well chuffed bloke. 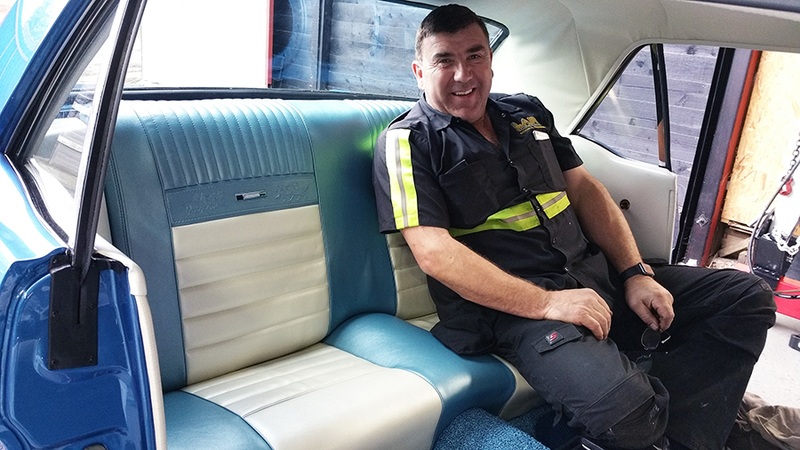 Thanks to Adam who had taken time out to wait for the seats to be completed and bring them back for me. Thanks to Chris for the extra pair of hands rebuilding the seats, his bad jokes and keeping the drinks flowing. This entry was posted in General and tagged door cards, foam, hardware, Mustang, Mustang Maniac, One man and his Mustang, Pony Interior, seat base, seats, springs. Bookmark the permalink. They look wonderful. I love the embossed horses too. All of the pictures were amazing. And I must add my vote for the embossed ponies. Outstanding! Hi ya Debbie, thanks for the vote. I did debate over it for about a year colour scheme, and I just had to put it back to the original. Thanks Nigel. A big step forward this weekend. Fantastic. The mustangs in the seats are really, super cool! Thanks Timothy, I just had to have the Pony interior, like you say it’s just those little things that make it look different. I love the pony embossed seats. Brings back great memories. Thanks, I just had to have them. They just seem to set the car off.